It’s the one hundredth mystery object and I’ve decided to give you a challenge that I had to deal with at work this week. I found a box of mandibles with no data, I identified them and checked them against their respective specimen types in the Horniman collections (that I’ve worked hard to organise for such a purpose). The whole process took me half a morning and 5 of the 6 specimens were successfully reunited with the skulls they were separated from over 70 years ago – a satisfying outcome for a curator (our fun is cheap). Put your suggestions and questions in the (newly organised) comments section below and I’ll do my best to respond. E looks like a fox and is about the right size. F is a big cat, maybe a leopard. So far you have one right, but you’re very close with the other two. Just realised you’d set A-F and I went and ruined it by going 1-6. A and B look much the same to me, and much like the animal I heard mentioned in the staff room the other day, so I shall refrain from guessing. 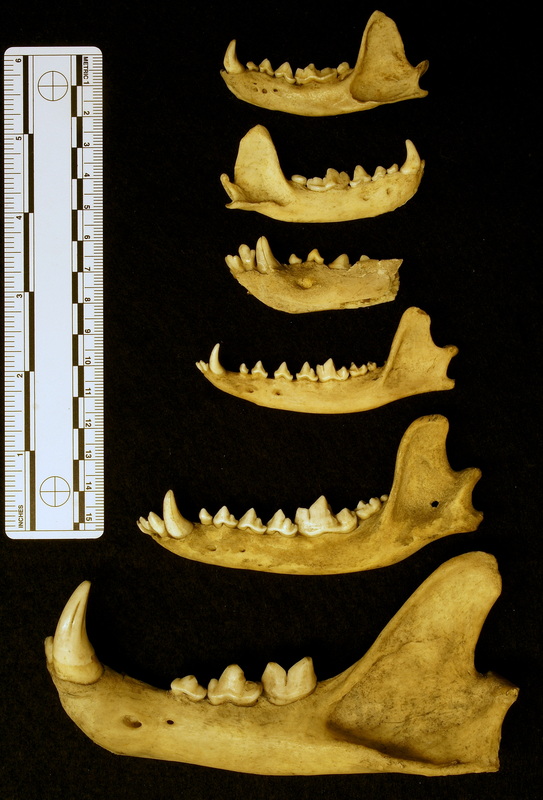 C is troublesome…the incisors are large, and the canine relatively small, so I’m going for something onmivorous (and possibly old by the bluntness of the teeth? ), but that doesn’t narrow it down much. I’m tempted to suggest it’s another canid, because I can’t think what else fits. But I suspect I’m wrong. A and B could definitely both be badgers, young ones, because the molar isn’t worn down. It hadn’t occured to me that there could be two of the same species, so I think I’ll agree with Jake and say both A & B are badgers. As for C, despite its position in the picture, I think it’s a much larger animal. A wolf, perhaps.